Oh. My. Gosh! 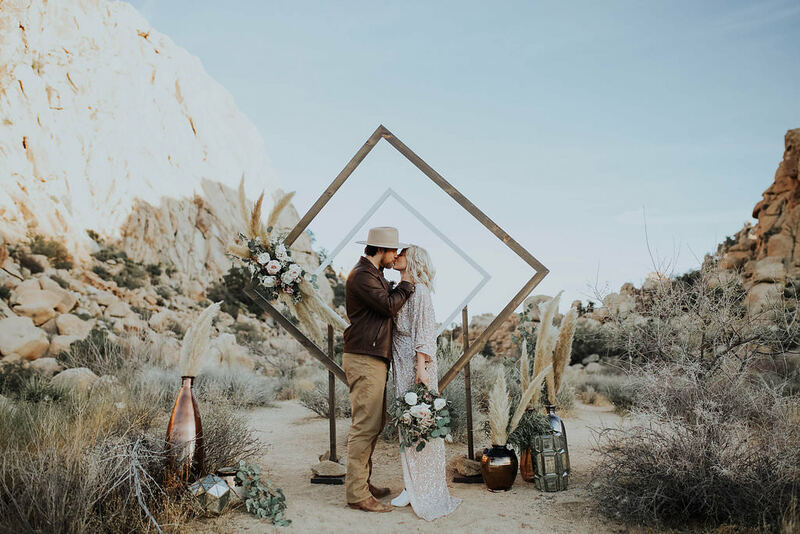 That is really all we can say about this amazing boho Joshua Tree stylized elopement. Seriously. 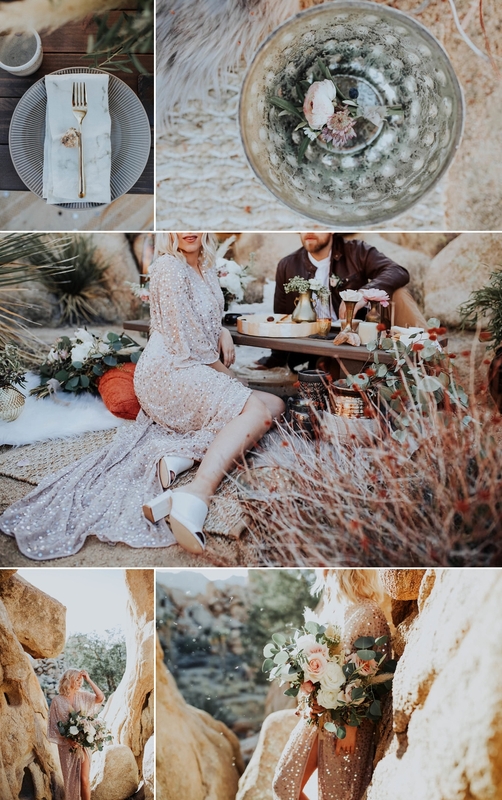 From the studded wedding dress to the stylish hat, this photo shoot is sure to give any bride considering a destination elopement in Joshua Tree, California some amazing wedding inspiration. And we have not even mentioned the table decor, wedding flowers and of course the diamond-shaped arch for the wedding ceremony. When it comes to stylized shoots and wedding inspiration, normally we like to give a little background info. 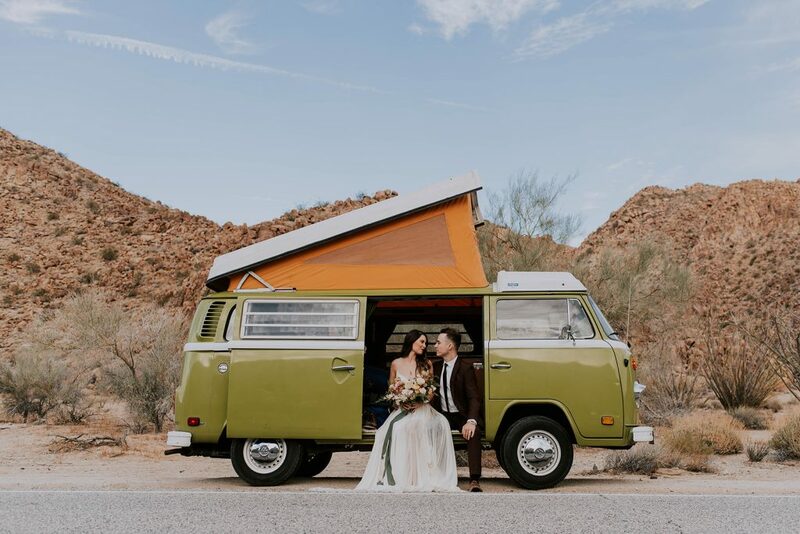 But honestly these photographs by Meaghan Brianne are so fantastic we will just let her tell you more about the day, the team of wedding vendors behind the shoot, and of course the epic vision behind the boho Joshua Tree stylized elopement session! I am in Joshua Tree at least five times a year and I am not complaining! The light is gorgeous and I always have a blast climbing the giant rocks and dancing in the desert sunset with my couples. 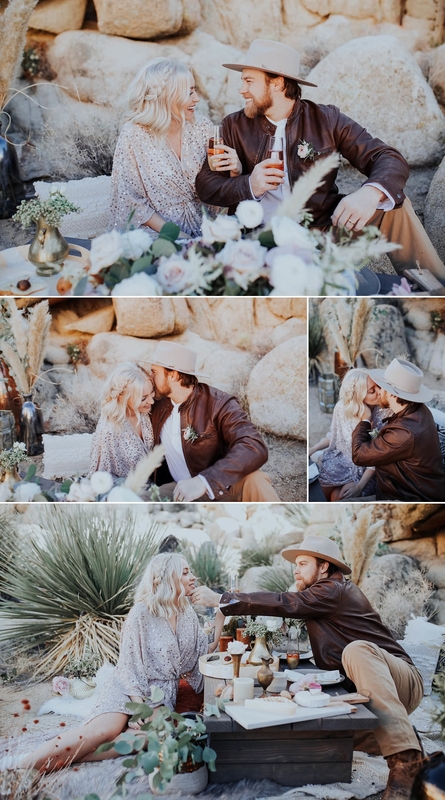 Although this was a boho stylized elopement I still wanted the models to embrace the energy and magic of the desert. The models for this shoot were actually the rad master minds behind that amazing arch! They totally understood the vision for the photo shoot and they fit the role perfectly. 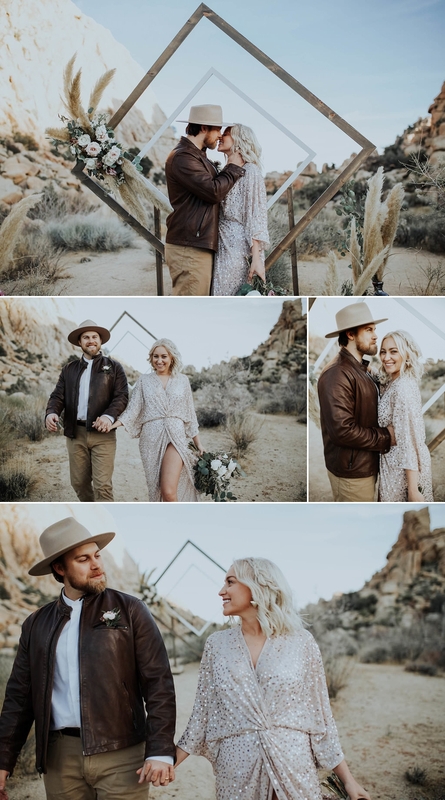 I approached this boho Joshua Tree stylized elopement the same way I approach any couples session. 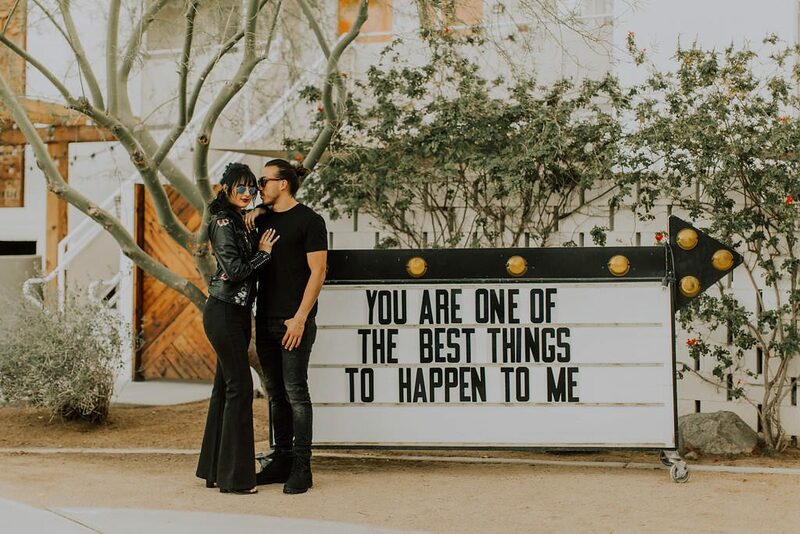 I work with the couple to create authentic, genuine emotion by just talking to them, making bad jokes and encouraging them to start spontaneous tickle wars. I would say my favorite part about Joshua Tree National Park is that there is beauty in every corner of this place. 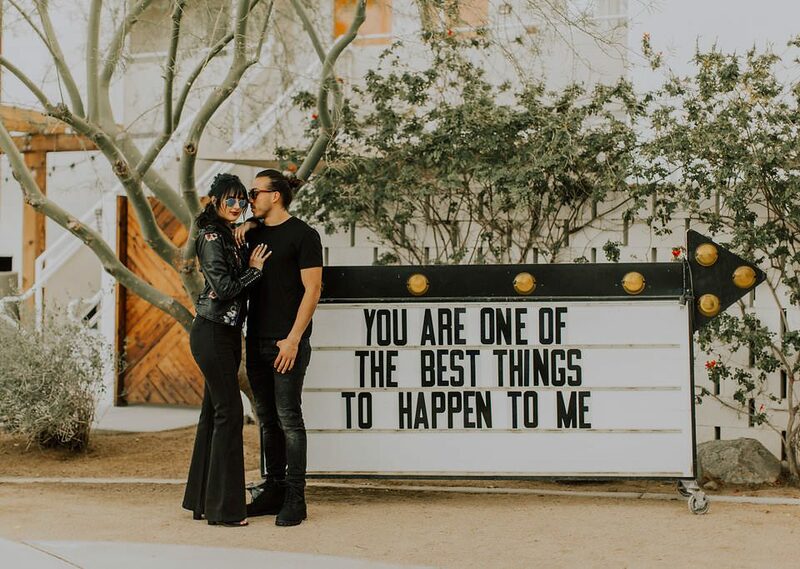 It does not have an ugly area at all and you can elope, get married or take your engagement photos anywhere here and they will be gorgeous! The light in Joshua Tree is so rich and the sunsets are INCREDIBLE. You can’t go wrong with dreamy warm light! I wanted this photo shoot to feel organic to the landscape we were shooting in. I wanted the decor to be a reflection of the beautiful park. In order to make that vision a reality I decided to go with a more muted color palette to make the couple be one with there surroundings! 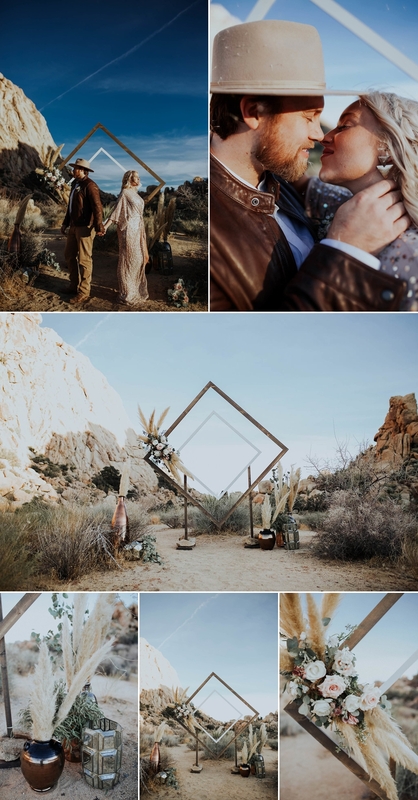 As for my favorite moments from the boho Joshua Tree stylized elopement I would have to say the whole day was magic. 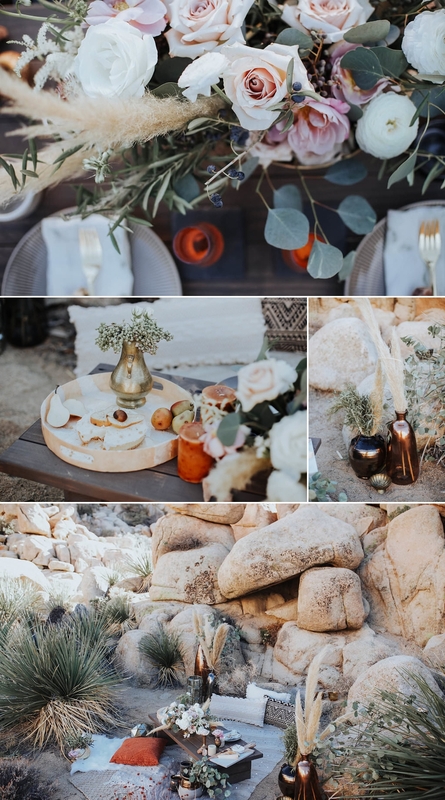 However, if I had to pick one single moment from the photo shoot in Joshua Tree I would say seeing everything set up and all the rad wedding vendors work come together. Seeing our vision for the shoot come to life was pretty sweet! My name is Meaghan Brianne and I am the Owner and Photographer of Meaghan Brianne Photo and I am based out of Downtown Long Beach,Ca.I don’t take myself to seriously and I am always searching for my next big photo adventure. I am married to the coolest graphic designing, bass playing dude around that doubles as my second shooter ( SCORE!!). I could eat breakfast burritos for every meal and am obsessed with Green tea lattes. I started my photography journey back in 2012 but I have been shooting since high school. I went through a couple name changes as well as style changes in my work as I grew as an artist. I started shooting friends in empty alleys or on lush trails, we would get them all dolled up and just have a blast. I feel in love with weddings when I second shoot my first wedding with a friend and immediately knew that this was the direction I wanted to take my career and I am having the best time. Oh and if I could have one supper power I think it would to control the weather! Please let me know if you need any additional info! 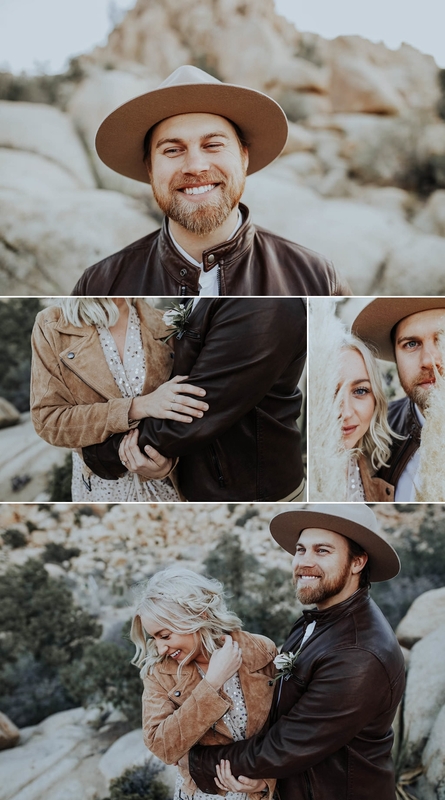 The team is so stoked to be featured on your rad page and we hope the viewers love this shoot as much as we did creating it! 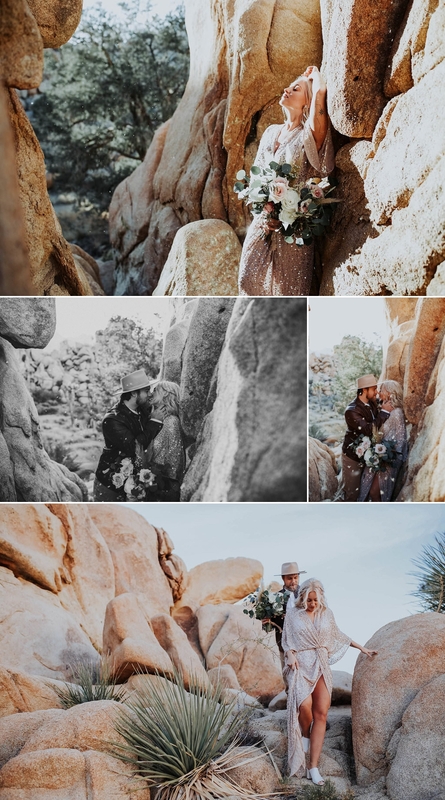 Those interested in viewing more stylized elopements in Joshua Tree can check out the photos captured by Chris Ashton at the most recent Yellow Workshop! 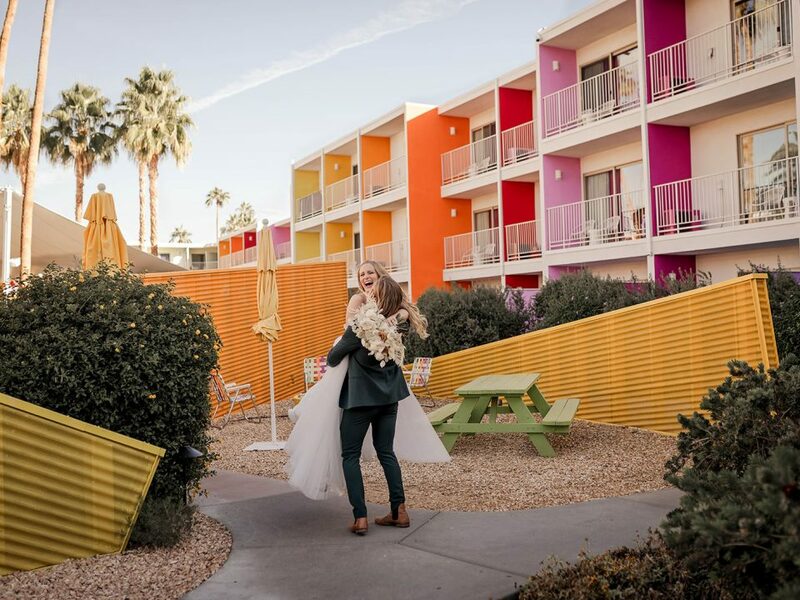 Ryan is a destination wedding photographer currently based in Southern California. 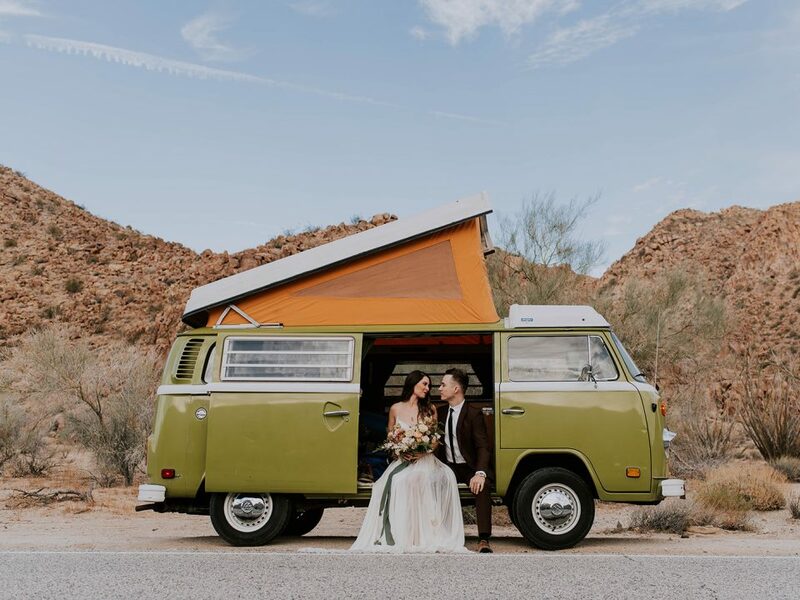 Ryan’s wedding photography has been featured in Palm Springs Wedding House, Peta Pixel, Green Wedding Shoes, June Bug Weddings and many other photography publications both online and in print. 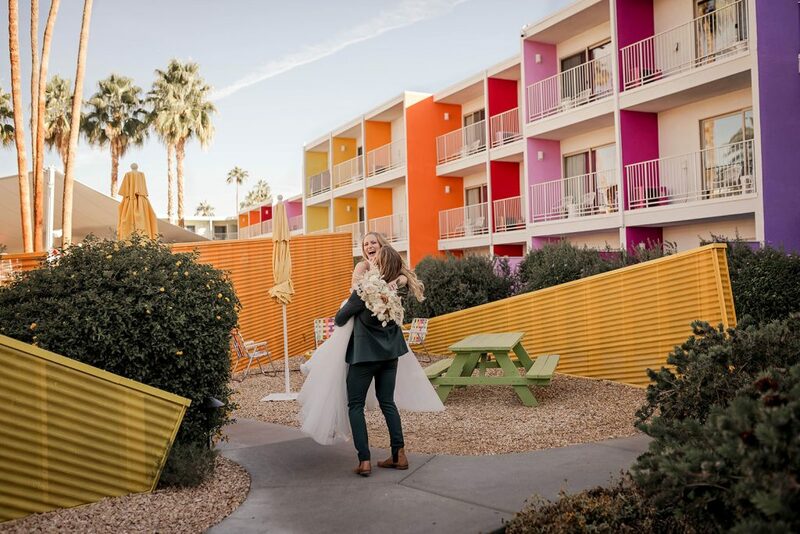 Ryan is a destination wedding photographer currently based in Southern California. 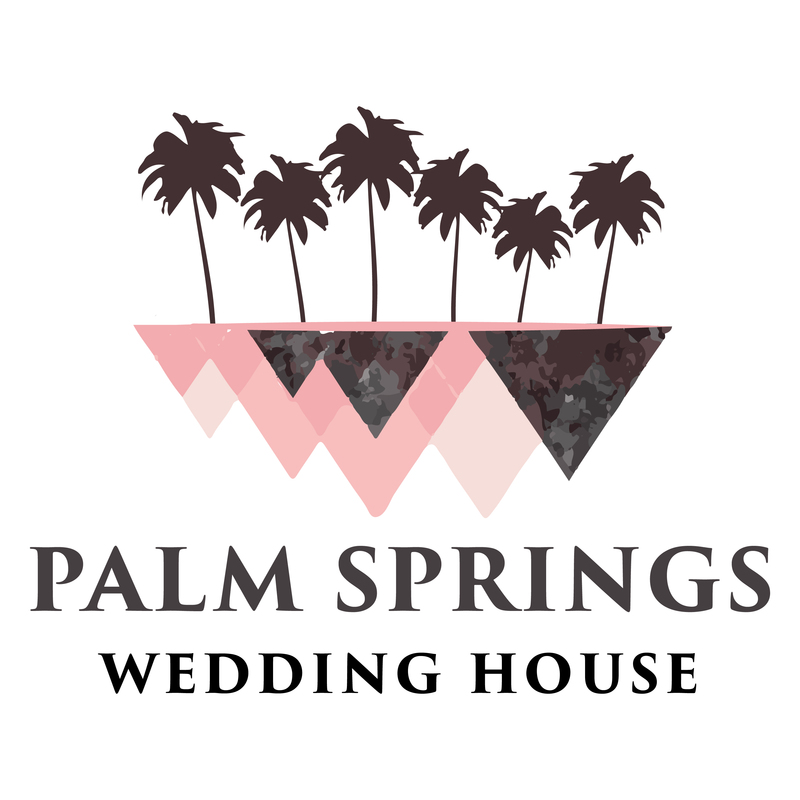 Ryan's wedding photography has been featured in Palm Springs Wedding House, Peta Pixel, Green Wedding Shoes, June Bug Weddings and many other photography publications both online and in print.